Wasan Kongjan announces the upcoming seminar for people interested in investing in small hotels in Chiang Mai, to be held on October 15 at Chiang Mai Grand View Hotel. 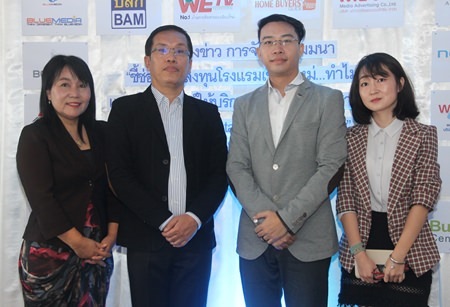 The booming hotel business in Chiang Mai will be the topic if a seminar to be held on October 15 by Modern Property Consultant Co. Ltd the Managing Director, Wasan Kongjan, announced recently. The seminar, which will be held at the Chiang Mai Grand View Hotel from 8:30 a.m. to 5 p.m. will suit those interested in investing in, or who already own, small size hotels, guesthouses, boutique hotels and others in that size range. The seminar will discuss such issues image, room rate adjustments, and improving professional management. Also under discussion will be the appropriate forms of investment, target group trends, location relating to main targets, and expansion of purchasing power. The seminar registration fee is 10,000 baht and will cover two people. The Managing Director said that already have over 200 applicants. At the event attendees will meet successful owners of hotels which have full occupancy for the whole year, such as Bed Prasingh, Bed Nimman, S-Trip Poshtel, and Sleepbox. The owners and managers will reveal ideas and tips for project operation including location selection, design, target customers, marketing methods. A marketing team from Agoda will also be attending the event to offer tips for using Agoda. Wasan Kongjan noted that Chiang Mai has a great potential for investing in tourism and as the hub of economic activity for the North it links Thailand with China and the AEC. The GPP of Chiang Mai has grown at about 8 percent per year for the past 10 years. GPP was 184,132 million baht in 2014 and was the highest in the North. Tourism in Chiang Mai has grown from 3 million people in 2010 to 7.4 million in 2015, a 146 percent increase in five years. Chiang Mai International Airport has also seen tremendous passenger growth during this period and in 2015 reached 8.3 million passengers with 982 flights per week. The Airports of Thailand predicts passenger numbers will reach 14.6 million by 2025 and has plans for expansion to handle 18 million passengers a year. The government is also putting for the high speed Bangkok – Chiang Mai train route, an MOU was signed with Japan to start on that on August 6th and construction is expected to begin in 2018. Other infrastructure projects include linking Chiang Mai – Chiang Rai with a better road, outer ring road, and electric train in Chiang Mai. The government will promote Chiang Mai to be a center of international tourism and service provider; MICE City and Wellness City, the center of commerce, investment, and transportation : Northern Land Port, city of safe agriculture : Northern Food Valley, Center of international education to universal : Education Hub, and nice place to live : Eco-Town Eco-Village. He said that investors should take care as it requires care and to ensure that one falls within laws such as land titles, licensing, and building modifications. Mr. Wasan also noted that new businesses must have good marketing and an understanding of their target groups, for example Thai tourists like to visit in the winter. Interested people can make reservations at [email protected] , or call 02-294-9368-9, 081-424-3683 Fax: 0-2294-3358, Official Line: @m-property, for additional information at Facebook: Modern Property Consultants or website: www.m-property.co.th..